Everything that looks like candy is not, in fact, candy, and some kids are learning this the hard way — by eating colorful laundry detergent pods and winding up in the hospital. It's true that some of those pre-measured detergent bits wrapped in plastic look Jolly Ranchers on 'roids. And it would be especially easy to mistake those things for candy if you were two years old. 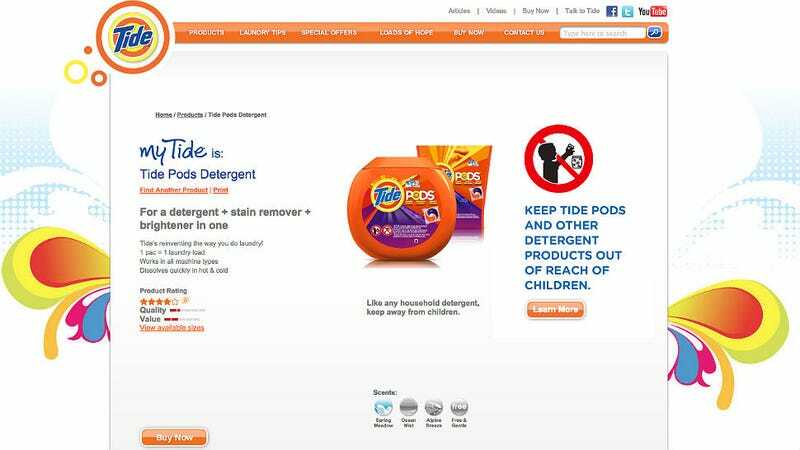 That said, according to a study published by the journal Pediatrics, between 2012 and 2013 over 17,000 kids under the age of six ate detergent pods. While only a small percentage of those children were hospitalized (and only one child has died), when we're drawing from a pool of 17,000, it adds up quickly. Most of the victims were under the age of three, but it isn't just kids mistaking pods for edibles. According to the Washington Post, one grandmother gave her baby granddaughter a pod as a teething toy by accident and when the baby began vomiting uncontrollably, they took her to the hospital. The little girl ended up fine thanks to swift medical intervention, but it could have ended much differently. Now the detergent companies are saving consumers from themselves by adding "guidance" language onto their packaging that probably says something like 'Don't eat this, it's for your clothes, dude.' Too bad most two-year-olds can't read.